Persian cats are among the most popular of cat breeds and they are also the longest known pedigree cats. Many of them tend to be white but they actually exist in a variety of colors and patterns. The breed has around sixty different color variations. Persian cats are famous as a result of the long hair and body type. These cats have flat faces, small ears, short noses and wide chests. Their legs are sturdy with large paws. The most unique trait of these cats is their thick, soft coat of fur with a ruff around the neck, and a tail that hangs quite low. These cats are a very expensive breed of cat and come in different types. These cats are often seen participating in cat competitions, where they are separated into seven different categories based on colour. 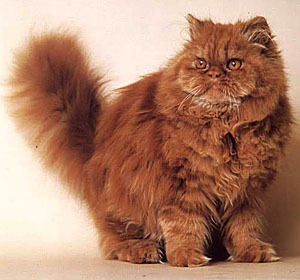 These colours of Persian Cats are solid, bicolour, shaded, tabby, silver, gold, smoke and Himalayan. Persians get noticed for their long, flowing coat as well as their colour. Persian cats are popular as they have very gentle personalities. They are wonderful companions to have and can be ideal as pets for children because they are very low maintenance and can therefore easily be looked after. They don’t require a lot of attention but they do enjoy being playful and affectionate. Persian cats are extremely vocal and can communicate well using their soft, pleasing voice as well as their eyes. They are not too active and do not jump or climb as much as other cats to. They tend to like spending lots of time lounging around and being admired. Persian cats are best kept inside the house so you can protect their lovely coats. Going outside can easily damage their coats, and can also make the cats susceptible to diseases and common parasites. Grooming Persian cats is the only maintenance they need as they cannot maintain their own coats like most other breeds of cat. This can be timely work, because their fur is dense and very long. It needs to be brushed every day using a metal comb, otherwise their coat stands to get tangled up in hairballs, and it ends up looking oily and losing its shine. Unlike most other cats, you will be surprised to know that you also need to bathe Persian breed of cat regularly in order to keep its coat clean, healthy and looking its best. They also need to be dried fully after their baths. Trying to bathe a fully grown Persian cat will be a troublesome and very difficult activity, so start bathing it as a kitten to get them used to enjoying their regular baths. this cat is so ugly it is cuter than cute… i think it is the cutest cat ever!!! wow i just befor i clicked the botton what it would look like and i said it would be cute and fluffy and it was fluffy alright!!!!!!!!!!!! wow i thought before i clicked the botton what it would look like and i said it would be cute and fluffy and it was fluffy alright!!!!!!!!!!!! 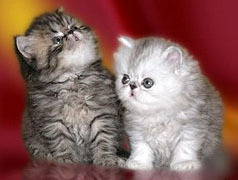 Persian cats are very ugly!!! Persian cats – very cute cats ever!!! Persians are the most beautiful cats, not ugly! My cat is Persian and I love him. I have a Doll Faced Persian, he is the cute version of a “normal Persian”, for anyone that thinks all persian cats are ugly, check out a picture of a Doll Faced!!!! wow! the doll faced ones are so adorable!!! wats the difference b/w persian cat and himalayan cat..???? Himalayan cat, in fact, almost identical to the Persian cat with the exception of blue eyes and point coloration. Himalayans just have exclusively blue eyes and are color pointed like the Siamese. I read something about them being a Siamese Persian mix. A himalayan is a pointed persian. i am not sure if my cat is half persian. she fits the description. she has a very mean looking face lol. and she has huge almost fully round eyes. she has a flat face. and her head seems kinda wide. and she has a lot of muscle and she has huge paws and muscular legs. would my cat be half persian? Yes. It is a very very pure breed 100% PURE BRED. I don’t know if mines a pure one becus its plays alot and speedy. It also spends most of its time sleeping. But we do have certificates of it being a Persian. wow! I always wanted one and ignore those who say they are ugly cause they are jealous of themselves being ugly! Female one's a brown tabby, while the male's white. Weird. The Female's fur is 2 cm shorter. 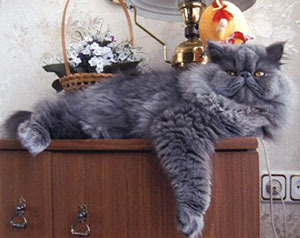 Persians aren’t ugly, if you go to a shop full of persian cats, you won’t be able to go home without buying one! I have a Persian a friend gave to me, because she wasn’t being loved enough. She is very lovable, cute,has long long fur I have to brush every day, She is a calico color and did I mention she is very cute, cute as a button!